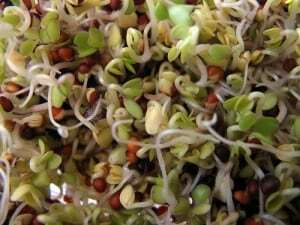 Sprouts grown from organic sprouting seeds are not only delicious but they are nutritious too and can be added to a variety of dishes for added flavor. You can also consider using these to start a vegetable garden from scratch. The reality is that genetically modified crops are in abundance and are proven to have detrimental side effects. Choose organic to ensure that you are growing top quality sprouts. Sprouts have a delicious nutty flavor and are full of goodness, containing vital minerals, proteins and nutrients that assist with proper functioning of the organs and cells. They are guaranteed fresh because they are live when eaten and of course, they cost very little to produce. Our digestive systems cope very well when digesting sprouts grown from organic sprout seeds and we benefit from them being at their peak growth cycle, compared to foods that have been stored for long periods and lose their nutritional value. Home grown sprouts from organic sprouting seeds give you control over growth and storage conditions and ensure that the produce is not contaminated with harmful pesticides. Seasonal changes require the long-term storage of much of our fresh produce, resulting in a reduction of nutrient content as the products age. Other items are shipped over long distances and although they may look good to eat, they have lost some of their nutritional value. Home grown sprouts from organic sprout seeds negates this and is inexpensive, requiring only a wire mesh and a sprouting jar. Twice daily rinsing of the sprouts is all that is required. You can have a fresh batch of ready to eat sprouts in as little as four days. Choose non-toxic food varieties such as mung beans, lentils, peas, alfalfa, fenugreek and radish. 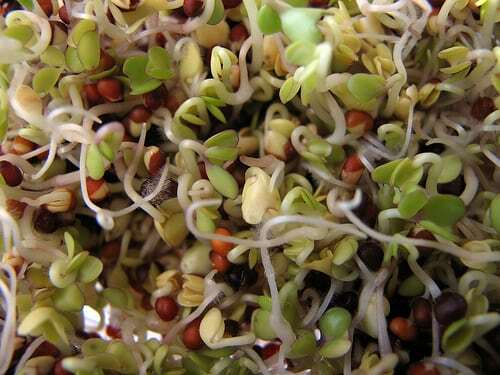 Other tasty varieties of sprout seeds include mustard seeds, garbanzos, quinoa, broccoli and cabbage. Most vegetable seeds can be used for sprouting. Grains that have no hulls are a good choice as they will sprout in just a few days. Ensure that you buy only certified organic seeds or sprouting seeds for best quality and freshness. Organic produce is never exposed to pesticides or other harmful chemicals, so you are buying truly healthy produce. have never been treated with pesticides or harmful chemicals. There is also a reduced likelihood that the seeds have been exposed to animal waste thus reducing the chances of accidental salmonella exposure. To ensure that your growing sprouts remain uncontaminated you should grow them in bird and rodent proof storage areas. After their initial sprouting phase you should store them in a refrigerated unit to ensure that they remain fresh. Alternatively collected seeds should be dried carefully and also stored in an area that is rodent and bird proof, as this could lead to contamination. Growing your own sprouts from sprouting seeds you have collected yourself can be a very rewarding experience. Sprouting your own home grown organic seeds can be extremely rewarding, particularly due to the fact that you have the peace of mind in knowing that they are contaminant free. Being truly fresh ensures that you enjoy them at the height of their growth phase, when they are full of natures goodness. With organic sprouting seeds you will be assured of that.